On the 5th of February, the fifth Investment Evening of this academic year took place. Our speakers were Dirk Vriend and Beatrijs Goeman Borgesius of Mentha Capital. 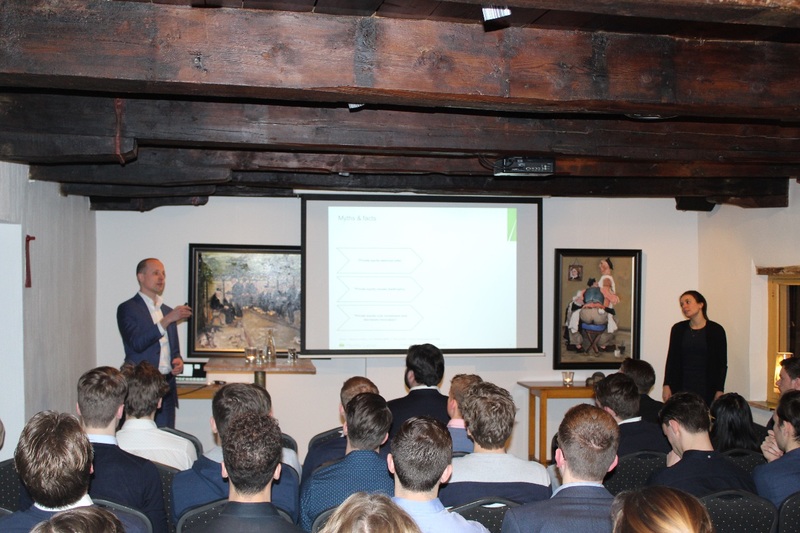 The lecture of Mentha Capital provided both a clear overview of the private equity world, as well as the interesting vision of Mentha Capital within this industry. The evening started in Café de Sleutel with an introduction of the relevance of private equity in our society by Mentha Capital. A short movie was shown of a typical day at Drik and Beatrijs their company. The main person in this movie uses products and services of a wide variety of companies held by private equity funds. After this movie, the goals of private equity funds were discussed. Buying companies with potential, increasing the performance and the potential of companies, and profitably reselling the companies. Mentha divided the private equity market in six categories and two ranges. They presented a range of small to large target firms. Within this range, funds can be either hands-on or hands-off. Mentha focusses on medium sized firms with a hands-on strategy, which means they are actively involved in the company strategy. After this part, Mentha introduced the private equity cycle of five to nine years. During this part, the vision of Mentha on this process was explained. A lot of interesting questions from the students were answered and an interactive environment emerged. Visions on who are the potential buyers, how to strengthen the market position, and how to close the deal efficiently were exchanged. These questions triggered both the students and the guests of Mentha to continue their conversations during the drinks. In a full café the Candidate Risk Board 2018-2019 was announced. In the upcoming months they will prepare themselves for their board year. We look back at an interesting and successful Investment Evening that provided useful knowledge of private equity funds. We hope to see you on the next Investment Evening on the 14th of May!